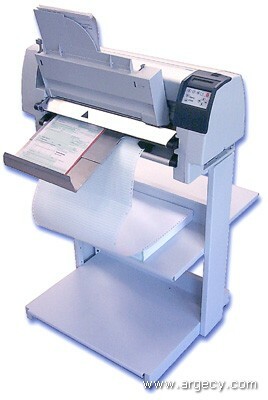 The PP 806 is the first product of a new generation of professional matrix printers. The rugged metal design, the paper run control and the ribbon run control guarantee reliable unattended printing. With ist proven connectivity concept the PP 806 is prepared for any network environment. This multi-purpose printer can take advantage of up to 6 different paper inputs for fanfold and cut sheet paper. With its new engine kernel design the PP 806 stands out by ultra precise registration on eevery page. The high print speed of up to 700 cps and a throughput of up to 580 pages/hour fulfil also professional requirements. The cost per page of the PP 806 is one of the lowest in its class. The PP 806 is a 132 column (at 10 CPI) Serial Dot Matrix impact printer specifically designed to meet the rigid requirements of printing "on demand", transactional documents, day in and day out. Document types include invoices, shippers, medical forms, hazardous waste manifest, etc.